Due to the enormous popularity of our Wine and Sign events in Corte Madera, Indivisible Marin is expanding its post carding program to meet the demand of our enthusiastic volunteers and to offer an additional convenient location for our members who live in North Marin. We will be hosting two "Write to Win" events in August at Sports Basement on Vintage Way in Novato. Families and students of all ages are welcome! 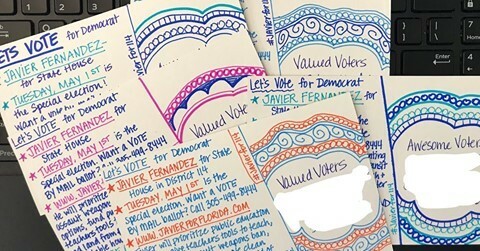 Join us from 7 – 8:30 pm on Wednesday, August 8th and Wednesday, August 22nd to write postcards in support of Katie Hill’s US congressional campaign in CD 25, currently considered a toss-up race. Katie grew up in the district and is the executive director of the largest non-profit provider of homes for the homeless in the state of California. If elected, she will be the first openly bisexual member of congress. Katie is not accepting any campaign money from corporations or Super-PACs. Fine out more about Katie and her progressive platform here. Post carding is a very effective way to reach out to voters, encourage them to vote, and support strong Democratic candidates. We offer post carding, as well as weekly text and phone banks, in coordination with campaigns for candidates in red districts to help flip Congress and take back power in Washington! All post carding supplies will be provided and light snacks served. Please note that, per Sport’s Basement policy, no alcohol will be served.